Revilo Oliver’s texts on Aryan ethnosuicide and the need to create a religion of hate have moved me to translate some explanatory notes of Thus Spoke Zarathustra at the bottom of this entry (see also my first post in the comments section). “You great star! What would your happiness be if you had not those for whom you shine! For ten years you have come up here to my cave: you would have tired of your light and of this route without me, my eagle and my snake. But we awaited you every morning, took your overflow from you and blessed you for it. Behold! I am weary of my wisdom, like a bee that has gathered too much honey. I need hands that reach out. I want to bestow and distribute until the wise among human beings have once again enjoyed their folly, and the poor once again their wealth. For this I must descend into the depths, as you do evenings when you go behind the sea and bring light even to the underworld, you super-rich star! Like you, I must go down as the human beings say, to whom I want to descend. So bless me now, you quiet eye that can look upon even an all too great happiness without envy! Bless the cup that wants to flow over, such that water flows golden from it and everywhere carries the reflection of your bliss! – Thus began Zarathustra’s going under. The above German-English translation by Adrian del Caro is taken from Thus Spoke Zarathustra (Cambridge University Press, 2006). This Cambridge edition lacks the more detailed notes by Andrés Sánchez-Pascual in Así Habló Zaratustra (Madrid: Alianza Editorial, 2014). Thus, I have translated Sánchez-Pascual’s notes to English. Page numbers refer to that edition in Spanish. This § 1 of Thus Spake Zarathustra literally reproduces the aphorism 342 of The Gay Science. Only the “Lake Urmi” that appears there is here replaced by “the lake of his home.” The aforementioned aphorism is entitled “Incipit tragædia” (Tragedy begins) and is the last of the fourth book of The Gay Science, entitled “Sanctus Januarius” (St. January). This is the age at which Jesus begins his preaching. See the gospel of Luke, 3, 23: “Jesus was about thirty years old when he began his work.” In the sought antagonism between Zarathustra and Jesus, this is the first of the confrontations. As can be seen throughout the work, Zarathustra is partly Jesus’ anti-figure. And so, the age when Jesus begins preaching is the same in which Zarathustra withdrew to the mountains in order to prepare for his task. Immediately after, a second contrast between the two becomes apparent: Jesus spent only forty days in the wilderness; Zarathustra spent ten years in the mountains. “Untergehen.” It is one of the key words that illustrate the figure of Zarathustra. This German verb contains several nuances that hardly may be held simultaneously in the Spanish translation. Untergehen is primarily, and literally, “walk (gehen) down (unter).” Zarathustra, in effect, gets down from the mountains. Secondly the term usually designate the “sunset,” and Zarathustra makes it clear that he wants to act like the sun at sunset. Thirdly, Untergehen and the substantive Untergang are used to mean sinking, destruction, decay; thus the title of the famous work of Spengler’s, Der Untergang des Abendlandes (translated as The Decline of the West). Zarathustra also declines in his task and fails. His task, he says several times, destroys him. As a Castilian terminus technicus of Untergehen, here it has been adopted “hundirse en su ocaso” [Note of the Ed. : literally, “sinking into his sunset”—contrast it with the Cambdridge translation, “go down”] which seems to retain the three senses. However, Nietzsche plays countless times with this German compound word and also in contrast to other compounds. For example, he contrasts and joins Untergang and Übergang. Übergang is “passing to the other side” over something, but it also means “transition.” Man, Zarathustra would say, is “a transit and a sunset.” That is, by sinking into his decline, like the sun, he moves to the other side (of the earth, it is understood, according to the old belief). And “passing to the other side” means surpassing oneself and becoming the Overman. Visitors will be surprised to learn that a Spanish edition has more detailed endnotes than the current academic English translation of Nietzsche’s magnum opus (or the more popular Penguin Books edition which image appears at the top of this entry). This is because Spaniards, as well as the intelligentsia in Latin American countries, are fed up of Catholicism. North Americans have a few centuries experimenting with Christianity. Spain has more than a millennium and a half, and our parents’ religion is on its last dying breaths there. 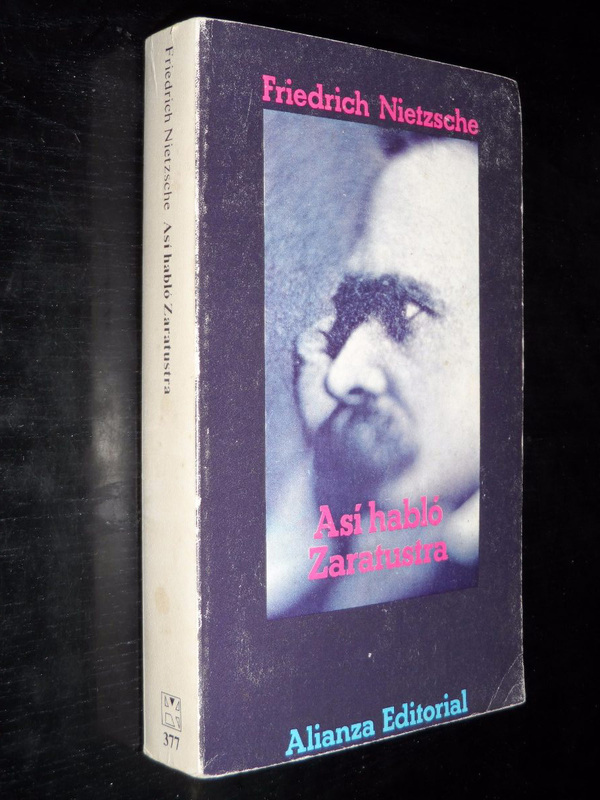 Andrés Sánchez-Pascual’s scholarly translation of Nietzsche’s books since the early 1970s became so popular that over the decades he has received hundreds of letters from his Spanish-speaking readers. The book’s edition of Así Habló Zaratustra that I purchased this month for example (I lost the old copies that I used to read sporadically in the 1970s and 80s) is its twentieth edition. So fed up of Catholicism is Spain’s thinking classes that, again, the copies I bought of Karlheinz Deschner’s Kriminalgeschichte des Christentums which introduction appears in my compilation The Fair Race’s Darkest Hour, were translated to Spanish for an audience unexpectedly avid of this sort of extremely scholarly material (Deschner’s maximum opus has yet to be translated to English). Another example. Manu Rodríguez, who has had a place of high honor in this site and in The Fair Race, is also an avid reader of Sánchez-Pascual’s translations of Nietzsche. Thanks to his revaluation of Christian values, Rodríguez overcame his original prejudice against National Socialism in his later posts of La Respuesta de Europa. With the exception of non-Christian geniuses like Revilo Oliver and William Pierce, I have not seen such a metamorphosis of the mind in most of the English-speaking racialists.